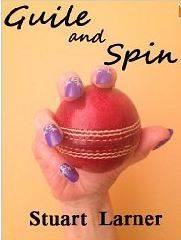 Guile and Spin by Stuard Larner is a novel based around a tennis coach taking up cricket in order to earn a grant for his recreation centre. It is set in a small town in England, and follows the interaction between a handful of characters through a cricket season. When I first started reading Guile and Spin, I was quite disappointed. The book starts off going into excruciating detail about everything in a way that is quite distracting. The writing at first seemed quite clumsy and the characters quite plastic. However, the book is written as a fun read and not as a piece of high brow literature and it succeeds in that. Eventually I quite enjoyed it. Once you look past the overly stereotyped characters, and the annoying detail, the story is a good fun read, that has a couple of plot layers, some of which are fairly predictable, but others that throw up some surprises. It is ideally suited to the e-book format, and would be a good read while sitting on public transport. It's also probably a great read for a teenager who is a fan of cricket. I could imagine a number of the boys that I coach really enjoying reading this. In summary, it's not going to win any prizes for literature, but it is a fun read, that may be a very good Christmas present for a cricket obsessed teenager.